High-kick competitions were once part of Kivgiq, the Messenger Feast. As each man entered the qargi he tried to kick an inflated animal bladder or ball suspended from the ceiling. An Iñupiaq story tells of a young woman who owned two balls; the larger was the sun, and the smaller the moon. The sun ball fell (or in one version was dropped by Raven) and burst open, bringing light to the world. The circular designs seen on this ball represent the sun and commemorate this ancient story. Herbert Foster, Sr.: Taipkua suli kivgiqamiŋ aqsraaġuuniqsut- aqsrautraġuuniqsut- aqsraisuqtuatiplutiŋ- qargiisuqtuatiplutiŋ. Feast-taqmatalu taipkua suuraġuurut, kivgiqmatalu. Kivgiġñiqsutkiimma taimaŋŋaaglaan taipkua iñuich. Sylvester Ayek: Innautait ‘aa pinaġuu’yuutauraataqpat ipkua? Faye Ongtowasruk: Nuŋani…, nunaŋiniglu, pitqataqsimaaqtuat naluaniglu suli someplace siuġaġaqtuq samma tauq qiniqtaaġa. Sylvester Ayek: Taamna ‘aa ilaatnizaaq kiziani atuqtavaruŋ? Faye Ongtowasruk: What they use for football, it’s bigger than this. Sylvester Ayek: Pinaġukyuutauratuq, football, aktuq taamna? Willie Goodwin Jr.: Aqsraaqtuat taunani tainnasiq atuġuugaat. Faye Ongtowasruk: Una qaaŋ aqsraasiaq? Aqsraasiaq? Rachel Riley: So, aqsraaq, football. Bernadette Alvanna-Stimpfle: So, aqsraasiaq, high kick. Willie Goodwin Jr.: High-kicking, you know, aqsraatchiaq [high kick]. Alvira Downey: Immakii high kick football-luŋat. Herbert Foster Sr.: Una aqsraq qiñikkaqput pilaiŋuruq tupqum iluanun- aqsraapiaŋuŋitchuq- niqsamik piliuqsimaruq- kaviqsitaqługu tamanna niqsaq suli niqsam sulliñġanik sullipayaaŋanik. Tuttum aasii-tia manusiñġanik tamarra qiñiqsittaaqaqhuni. Naluamik suli tamarra qatiqtaamik qatiqsiplugu nalualiuqhutiŋ savakługu inillaksimagaat- savaaġiniġaat- qupakługu. Aqsraŋich taipkua atlaurut – qaani silami aqsraaġutit. Marraliasiiñ aqsraatchiaqmata naaggaqaa ukalliaġaqmata savaaŋuruq- tupqum iluani-li- qargim iluani. (So these you are seeing are used for high-kicking inside or in a competition where you twist the legs forward, and they are done inside the qargi [community house]. Marie Saclamana: This must be for high kick, huh? Look at this [loop on top of the ball]. Jacob Ahwinona: They hang that and they use it for Eskimo high kick . . . . The one they use for playing football out in the open field has no fancies like that. Outdoor game ball would be plain, reindeer skin with reindeer fur stuffed inside and see, it’s sewed together for outdoor games with a football. 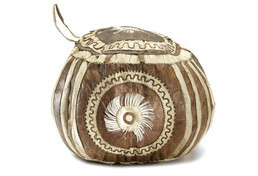 But this one is the ball used inside the qargi [communal house] where they can have high kick games. . . .This is the fancy one, for indoor so everybody can see it. Jacob Ahwinona: The high kick games, they played in the qargi [communal house]. They hang that [ball] usually when the different tribes get together. Each tribe tries to beat each others [highest] kick. When I was young, I used to kick that high. . . . . When you kick the ball that high, you don’t make noise when you hit the floor. You take your shoes off and when you kick, you don’t look at the ball … [One way they] do it is from your knees. Never mind that the ball [is] up there … and when that ball gets down there when you jump, you put your feet together. There’s nothing to it. The high kick was originally part of Kivgiq, the Messenger Feast, a winter dance and gift-giving festival hosted by Iñupiaq villages of northwest Alaska and by Yup’ik communities of Norton Sound, the Yukon-Kuskokwim delta, and Nunivak Island. (4) Kivgiq ended in the early years of the 20th century, but North Slope Borough Mayor George Ahmaogak, Sr. helped to revive it at Barrow in 1988. Umialit who had been guests at a Messenger Feast worked to save up food and gifts so that they could host the event themselves. Martha Stackhouse writes, “It was always a joy to see relatives and friends after not seeing them for several years. Iñupiaq oral tradition includes a story about a young woman who owned two balls; the larger was the sun and the smaller the moon. When the big ball burst open (in one story, Raven drops it from the sky), sunlight spread over the world for the first time. (9) Circular designs on this ball may represent the sun, as on St. Lawrence Island balls.